Making his Utah debut, it's blues/blues rock guitarist and vocalist extraordinaire, Nick Schnebelen. 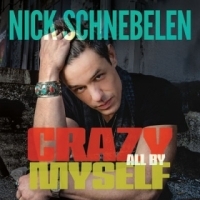 This is an album release show for “Crazy All By Myself” which just came out on March 1 -- produced by Grammy Award winning producer Tony Braunagel (Taj Mahal/Robert Cray). 2008 winner of the Albert King award (best guitar player) at the International Blues Challenge in Memphis! Sponsored in part by your UBS, this is a do not miss show - especially since it's FREE! Note: if inclement weather, this show will be moved inside and start at 10, not 7! Jason Ricci & the Bad Kind, Sue Foley, and Tab Benoit!! UBS Youth Blues Band, Backtrack Blues Band, Cafe R&B, The Connection with Monster Mike Welch & Friends, Mindi Abair & The Boneshakers, AND Ronnie Earl & The Broadcasters!! Keb' Mo' returns to SLC, this time solo, with another opening solo act, Jontavious Willis!